It's been a year since we requested so-called "purple files," and even though the premier himself has admitted such files exist, the official answer from the government is that they don't. A year has gone by, and the access to information commissioner hasn't even written a report on our appeal of the issue. Mr. Paradis's office had a system to vet access-to-information requests from the media and political parties. Bureaucrats bundled the “interesting” documents together and put them in a purple folder, waiting for Mr. Togneri to give the green light. "Miss! Miss! What does vendredi le 24 septembre mean?" "Our crayons over here are only small and old." The laudable efforts at bilingualism on the part of Son premierosité will of course already be well-known to regular readers. Boy. Someone really has it in for the most often-used conjunction in the English language. If this release is anything to go by, Tom Hedderson's department is now "Transportation Works". He is also the Minister Responsible for something that dutifully and sycophantically re-styled itself "Newfoundland Labrador Housing". And, after four years of being barraged with The World's Cheesiest Logo, there are many who have come to believe, erroneously, that province No. 10 is actually named "Newfoundland Labrador". Which would make Tom Hedderson the Newfoundland Labrador Transportation Works Newfoundland Labrador Housing Minister. Which, as it turns out, is what Brad Giffen of CTV News nearly called him the other day. Light the candles on the Information Cake, decorate the Document Tree, and blow the Vuvuzela of Accountability. It's Right to Know Week! Or, as the Mrs. Malaprops in charge of what passes for accountibility in Dannystan call it, the Right to "NO!" Week. There is an election on in New Brunswick! Look! Look! Election! Canada's National Newspaper, however, continues to report vicariously, and solely, through the good offices of the CP wire. The RCMP issue what might otherwise be a very useful graphic, a map showing the latest situation with regards to local states of emergency in areas hit hard by Hurrican Igor. They just don't publish it to their own incredibly information-sparse website. John Gushue reproduces it on his otherwise useful CBC blog, but without the vitally important colour key. The Telegram reproduces map and legend both... but at a painfully low and entirely illegible resolution. 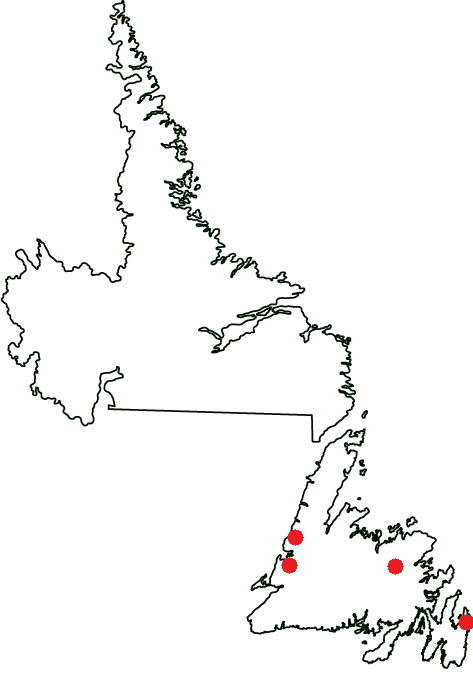 And VOCM also lowers the resolution of the original graphic, but if you clip and paste their version into a graphics editor, and zoom in on the text, you can just barely make out that the purple dots mark communities with declared states of emergency, while the red dots — Grand Bank, Marystown, Catalina, and Port Rexton — are described as having depleted food stocks. It has been almost 17 years now since Al Gore invented the World Wide Web. Sometimes people confuse causes and their effects, or vice versa. In defence of the Ottawa office and its approximate annual price tag of $400,000, Rowe looks to Quebec, which has had an office in Ottawa since 1908. Rowe said Quebec has found a way to get “millions and millions” of extra cash out of the federal government because of its office and the way it’s run. He said the Quebec office has eight to 10 staff, moving and shaking all over the national capital. There were rainfall records, including the rainfall of 238 millimeters at St. Lawrence, which was unprecedented for that location. Wow. Not only a record, but unprecedented, too! Well, y’know, I, y’know, any time, y’know, a leader and the leader of the country, y’know, comes in to have a look at things first hand, I, y’know, I’m pleased he’s done that, but, y’know, he’s done it two days after the fact, he never even gave us the courtesy, y’know, and not only me personally, but this is about the people of Newfoundland and Labrador, the courtesy of a phone call over the last 72 hours while all this was happening, to say don’t worry, we’ll be there, and we’ll work with the provincial and the municipal governments to get this done, so, y’know, he comes in on his own, and does it on his own, because, y’know, I and my ministers certainly would have met him at the site, and pointed out to him what we saw when the rivers were raging, quite frankly, right, everything’s pretty well settled down now, and some of the road damage has already been repaired in order to allow, y’know, the transportation links to be back, but anyway, y’know, he does things in his own way, and so be it. Presenting geography-heavy information, such as the locations of numerous road washouts, destroyed bridges, and whatnot, can be made convenient, easy, informative, and even fun, through the use of "maps". One-day rainfall records (mm and year the record was set) for the various observing stations, past and present, in Newfoundland. Note that this is not a list of records for Newfoundland overall, but only for individual stations. That is, the second-largest single-day rainfall may also have been in Pools Cove. File next to "Victoria to Halifax"
"Take Back the Night" marches will take place this evening across the province. The marches are part of Sexual Violence Awareness Week and will take place in the Rocky Harbour area, Corner Brook, Gander and St. John's. Here are those locations, "across the province", cleverly plotted on a map. Perhaps Happy Valley-Goose Bay is not in "the province". Terry French sets another fine example for fitness and recreation in the province by announcing “additional funding” under the Conservative Community Recreation Development Grant (CRDG) Program. Curiously, 25 of the 38 projects announced just happen to be in the four provincial electoral districts held by Liberal members. Coincidence, to be sure. Curiouslier, the other 13 projects are scattered among ten (and a half) PC-held districts, whereas other PC districts were the subject of Minister French’s Summer of Love series of press releases. The partisan affiliation of the former, and the comparatively modest amounts of money involved in the latter, are of course in no way connected to the decision to announce these 38 cheques wholesale, rather than retail, and late in the recreation season to boot. The corrosion of legislative process. ... and then there are sloooooooooooooooooooooooooooooooowwwwwwwwwwwwww news days. Tuesday must have been one of the latter at the CBC. January 14, 2010: Premier Williams announced the Government of Newfoundland and Labrador will contribute $1 million towards the urgent relief effort now underway in Haiti. September 14, 2010: The Honourable Dave Denine, Minister for Intergovernmental Affairs and Minister Responsible for the Volunteer and Non-Profit Sector, today announced that the Government of Newfoundland and Labrador will donate $100,000 through the Canadian Red Cross to help with relief efforts in flood-ravaged Pakistan. "I am pleased to announce today that consultants have been appointed to complete an in-depth analysis that will consider a range of options for the college, up to and including full university status," said Joan Burke, Minister of Education. "The feasibility study will provide the department with the information needed to make an informed decision on the future governance of the college, with the aim of increasing Grenfell’s autonomy." A feasibility study commissioned by government on the future role of Sir Wilfred Grenfell College in Corner Brook was released today. The Honourable Danny Williams, Premier of Newfoundland and Labrador, said government has reviewed the report and supports a preferred option that will give the college increased university status, within a single Memorial University system. Over the coming months, government will work with the Memorial University Board of Regents on the recommendations of the study. "This new governance model is an important step in allowing Sir Wilfred Grenfell to lead economic and social development on the west coast," said the Honourable Tom Marshal, MHA for the District of Humber East and Minister of Finance. "It is yet another example of the rejuvenation the Corner Brook region is witnessing under the Williams Government. To say I am delighted would be a massive understatement and I was honoured the Premier gave me the opportunity to make this announcement during yesterday’s Budget speech." March 26, 2009: Minister Burke noted that in keeping with the Provincial Government’s commitment to greater autonomy for Sir Wilfred Grenfell College, $2.5 million is being allocated this year to assist the college with that transition. September 10, 2010: Memorial University’s Board of Regents has accepted a recommendation that will give Sir Wilfred Grenfell College a new name. The Provincial Government today announced plans to fund up to $320,000 (and more if required) for a Newfoundland and Labrador-based observational study of multiple sclerosis (MS) patients who have chosen to undergo the experimental liberation procedure proposed by Dr. P. Zamboni. Now, the "up to" trick is as old as the hills. Saying that you are going to spend "up to $20.00" on lunch does not mean you are buying a $20.00 lunch. You could grab an O Henry bar and a litre of skim milk, and pocket the substantial difference. But this one is interesting. The Provincial Government (what? not Williams Government?) will spend "up to $320,000". They could spend less. Or they could spend "more if required". In other words: Provincial Government will spend a completely random amount of money. But you don't read that in the press release... at least not on its face. From a Ministerial Statement reproduced as Appendix G in a certain A. Brian Peckford's The Past in the Present (Cuff, 1983). There often seems to be the impression given that Newfoundland only receives by does not contribute. Nothing could be further from the truth. That’s why I was so pleased this year when the Business Hall of Fame inducted Great Big Sea into their annals. Our boys from Great Big Sea are the hottest ticket in town in Boston on St. Patrick’s Day! The endorsements do not come much better than that! Go on witcha! Not true! As Fred Shero, former coach of the Philadelphia Flyers said, if you don't want criticism, "say nothing, do nothing, be nothing." As Robert Browning said, "Tis looking downward that makes us dizzy." As Sir Winston Churchill once said, "If we are together, nothing is impossible. If we are divided, all will fail." Mason Cooley once said that, "Courage, determination, and hard work are all very nice, but not so nice as an oil well in the back yard." We persevered and we were persistent. In the words of Robert Half, "Persistence is what makes the impossible possible; the possible likely; and the likely definite." Mark Twain once said that "it takes more than three weeks to prepare a good impromptu speech." And part of this speech has been in the making for much longer than that. American actress, Katherine Hepburn, once said, "To keep your character intact you cannot stoop to filthy acts. It makes it easier to stoop the next time". I believe these words hold a dire warning for all Canadians. If Stephen Harper gets a majority government, I’ll remind you of the words of Bachman Turner Overdrive, "You ain’t seen nothing yet." Former British Prime Minister Benjamin Disraeli once said, "we are not creatures of circumstance; we are creators of circumstance". Well, as oil pioneer J. Paul Getty once said, “the formula for success: Rise early, work hard, strike oil.” Ladies and gentlemen, we are in the oil business. I quoted Oprah Winfrey to Cathy Bennett the last time I was here and l say it again today, "The future is so bright it hurts my eyes." Napoleon said "Leaders are dealers in hope." Disraeli once said, "The English nation is never so great as in adversity." I encourage the Prime Minister to consider the words of George Washington "Undertake not what you cannot perform but be careful to keep your promise." As Steve Jobs, CEO of Apple Computers once said, "Innovation distinguishes between a leader and a follower." The only problem is, as Larry Ellison, the founder of Oracle Corporation put it, "When you innovate, you’ve got to be prepared for everyone telling you you’re nuts." American composer and writer John Cage once said, "I can't understand why people are frightened of new ideas. I'm frightened of the old ones." Steve Ballmer, CEO of Microsoft Corporation, said that, "The Number one benefit to information technology is that it empowers people to do what they want to do. It lets people be creative. It lets people be productive. It lets people learn things they didn’t think they could learn before, and so in a sense it is all about potential." But I am reminded of the wisdom of another of your speakers, Golda Meir who said, "Don’t be humble, you are not that great." During this Super Bowl week, the words of Vince Lombardi are appropriate: "It’s not whether you get knocked down, it’s whether you get up." The Prime Minister’s actions reflect the words of Franklin D. Roosevelt: "The test of our progress is not whether we add more to the abundance of those who have much; it is whether we provide enough for those who have too little." The George River caribou hunting season in Labrador, which had been scheduled to open on August 10, was delayed as the result of preliminary information from a post-calving census conducted in July in partnership with the Government of Quebec, Laval University, the Nunatsiavut Government, Torngat Wildlife and Plants Co-Management Board and the Institute for Environmental Monitoring and Research. Now even more Childy, Youthy, and Family-Servicey! Child, Youth and Family Services Minister Joan Burke unveiled the Department's Strategic Plan Friday. Burke says their priorities are the safety and well being for all children and youth within supported families and communities. Burke says every department of government has a strategic plan that outlines their directions and priorities. She says they had a focus group to help them develop the planning. Burke says it will outline their plan for the next four years. She says they ensured their front line staff gave as much input as possible for the process. Alright. The new strategic plan — strangely, not a syllable about it over at ITAR-DAN — makes it clear that the department's "priorities are the safety and well being for all children and youth within supported families and communities". This corner, for one, is relieved, but can't help but wonder: what, pray tell, were the department's "priorities" before this super-awesome, new and improved, nitrogen-enriched "strategic plan" was "unveiled"? His Premierosity goes to Corner Brook to make a health-care funding announcement, and for some curious reason, the municipality is represented on the official program by one councillor Leo Bruce. Yes, that Leo Bruce. The Honourable Danny Williams, Premier of Newfoundland and Labrador and MHA for Humber West, along with the Honourable Jerome Kennedy, Minister of Health and Community Services, were in Corner Brook today for the announcement, and were joined by the Honourable Tom Marshall, Minister of Finance and MHA for Humber East; Dr. Minnie Wasmeier, Chief Operating Officer, Secondary Services, Western Health; and, Leo Bruce, Councillor, City of Corner Brook. The next day, His Premierosity goes to Labrador City to make a health-care funding announcement, and for some curious reason, the municipality is not represented on the official program at all. The Honourable Danny Williams, Premier of Newfoundland and Labrador, was joined by the Honourable Jerome Kennedy, Minister of Health and Community Services; Zoë Yujnovich, President and CEO, Iron Ore Company of Canada (IOC); Jim Baker, MHA for Labrador West; and, Boyd Rowe, CEO, Labrador-Grenfell Health, for the announcement. JFK said, "Let us never negotiate out of fear, but let us never fear to negotiate." I quoted this in one of my first speeches and have practiced it ever since. As JFK said, "Let is [sic] never negotiate out of fear; but let us never fear to negotiate." JFK said “let us never negotiate out of fear, but let us never fear to negotiate.” The new approach in Newfoundland and Labrador is to negotiate fearlessly, with a goal of getting a great deal for the province, but also fully prepared to do no deal at all rather than do a bad deal. Bobby Kennedy defined it best just before his assassination in 1968 when he said "GDP means everything ... except that which makes life worthwhile." John F. Kennedy said, "Ask not what your country can do for you but what you can do for your country." I say to Newfoundlanders and Labradorians, "Ask not what we can do for our country, because we have done enough. Let's ask our country what they can do for us." Seven years after taking office, the Williams administration has two Labrador cabinet ministers (there were none in 2003; Patty Pottle holds the other portfolio of Aboriginal Affairs). It is true that there were no cabinet ministers from Labrador in 2003... but only true for that portion of 2003 from November 6th to the end of the year. That was after Williams Administration justified His decision to leave John Hickey out of cabinet by arguing that "minute portions of the province can be left out." "Minute" Labrador contains nearly three-quarters of the provincial landmass. Prior to the 2003 election, and the change of government on November 6th, there had been, um, two provincial cabinet ministers from Labrador. “Labrador West is going to be the Fort McMurray of the East,” says Labrador Affairs Minister John Hickey. The economy of Lake Melville/Happy Valley-Goose Bay, a hub in terms of government, health, and transportation services, is equally as robust, he says. “One thing I don’t have to worry about as an MHA is people coming to me looking for a work. Anybody who wants a job can work. Hickey takes the boast a step further: “The future of this province lies in the development of the resources of Labrador,” he says. No one in Newfoundland, in the two and a half centuries that Labrador has been politically attached to it, has ever thought, even for a second, that the future is somehow attached to the development of the resources of Labrador? That only started seven short years ago? What else did Danny do in the fall of 2003? Say "Let there be light?" As I stated to the Canadian Club in Ottawa in June the ruling of the Régie once again demonstrated that province's bias, arrogance and discriminatory business practices towards our province. Apparently, their stranglehold over us on the Upper Churchill was not enough for them. I told Don, I enjoy the part of my job where I just get to run the province, developing policies and plans that move us forward as a people. I don't spend my time looking for a fight! As I said last week, one important component of the Lower Churchill development is obviously the ability to transmit the power. I will state again here today, that it is unfortunate that our neighbours at Hydro Quebec are not more cooperative in this regard. Power which was bought by Hydro Quebec for 0.25 cents per kw/h in 1976 is being sold for over 9.0 cents per kwh or 36 times more than what they pay for it. Some megawatt metaphors. From the pages — the news pages — of the Quebec Daily Newspaper. The one that is supposedly so very, very anti-Danny. If Danny Williams’ language was any stronger, the audience might have been asked to excuse his French. The premier wouldn’t want them to excuse Quebec, though. The Lower Churchill is a megawatt megaproject that’s a “major priority” for Newfoundland and Labrador. It wasn’t his first offensive against that province for its position, but it was arguably his strongest. That’s only the tip of the iceberg of the money Quebec receives from Canada, he said. The premier touted the Lower Churchill as the best green energy project in North America. PS: Quaere, what is the unit by which the goodness of an energy project is measured? Which project is the second-best? The New York Times explores the ethical minefield that is a uniquely American phenomenon, the political charity. Name-drop. The same names. Over and over again. From Rick and Seamus and Rex and Gordon – we have some of the most recognized and talented entertainers in the country. Our writers, our musicians, our artists – they embody who we are as a people and they promote this place like no business ever can. And now we have a whole new generation of movers and shakers, and our very own national heart throb in Allan Hawco. Let me say publicly today congratulations to everyone at the Republic of Doyle for your outstanding Gemini nominations! Our capital city never looked so good! We contribute culturally with our extraordinary talent, starting the day with Seamus O'Regan, ending it with Rex Murphy and being entertained in between by The Republic of Doyle, Rick Mercer and 22 Minutes. Right across the country, we start our day with Seamus O’Regan on Canada AM, and end it in the evening with Rex Murphy on The National. We begin the week watching the intelligent humour and commentary of Rick Mercer on Monday Report and we finish the week enjoying the satirical wit of the talented cast of 22 Minutes. I have to wonder if the lack of provincial government advertising in his Business Post paper ignited his latest tirade? I also have to wonder how 80 per cent of our provincial business leaders who read his paper view the label accorded them by Westcott — stunned, ignorant, naive and complacent. I’d love to be a fly on the wall when an advertising sales rep from Westcott’s Business Post comes knocking on their boardroom doors. I think Craig Westcott owes voters and non-voters across the province an apology for stooping to a new journalistic low — one that hit far below the belt. Just so you know: a log washing up on a Cape Cod beach is not newsworthy. In an e-mail statement, Labrador Affairs Minister Patty Pottle said the Quebec Innu have to have their claim considered in a federal land claim process that provides for agreements where two or more aboriginal groups have overlapping claims. She said the Quebec Innu have to deal with the federal government and the Labrador Innu. "The province would not ordinarily be a part of the overlap negotiations. This is consistent with federal comprehensive claims policy and the approach taken in the negotiation of overlap agreements between Labrador Inuit and Nunavik Inuit and between Labrador Inuit and Labrador Innu," Pottle said. "It should also be noted that the federal government has recently appointed a person to facilitate overlap talks between the Quebec and Labrador Innu." The Quebec Innu say their constitutional aboriginal rights in Labrador are being denied. [Réal] McKenzie said they are "looking seriously" at court action to potentially block the Lower Churchill. But Dunderdale said the government has a long-standing policy of not entering into negotiations with aboriginal groups outside the province while land claims remain pending within Newfoundland and Labrador. She said the New Dawn deal does not extinguish any rights of Quebec Innu, but any such claims would be handled by Ottawa. This agreement was reached following the recent helpful involvement of the governments of Canada, Newfoundland and Labrador, and Quebec and their respective commitments to settle certain issues concerning the land claims of the Innu. The Danny Provincial Williams Government is unusually modest about its role in such a beneficial outcome. Total number of ProvGov press releases issued in August: 187 (+26 from July). Total number with the phrase "Williams Government": 14 (-4 from July). Sycophancy index: 7.5% (-3.7% from July). Someone got the memo that August is polling month, and, unsurprisingly, the sheer output of ProvGov press releases jumped in August, driven in part by TCR and Health’s ongoing efforts to cheerfully announce every penny that they ever spend on anything. Surprisingly, however, it was a quiet month from a WilliamsGovernment perspective. It was fully nine days into the month before Jerome Kennedy and Diane Whalen got things moving, and another week before Tom Hedderson joined them on the big board. That week would turn into a flurry with Hedderson, Sullivan, Collins, Jackman, Collins again, and Kennedy crowding the goalposts. The month that started sleepy ended with a flourish. The final week saw Kennedy knock in two in one day, followed by another Collins, another Hedderson, and another Jackman. Sullivan and Whalen end up on the board with one apiece, Jackman has two, and Hedderson, tied with Collins at three, falls just short in his effort to reclaim the title he last held in June. Retaining his crown from July, your sycophant of the month for August, and for the third month of the last four, Jerome Kennedy! Congratulations, Minister! OK, so now it seems that the Inland Fish Enforcement Program was established by Danny Williams-Government to send a message to poachers. The Inland Fish Enforcement Program was established by the Williams Government in 2004 to send a clear message that the province would act quickly and decisively to apprehend poachers and others who abuse this resource. Since then, the Provincial Government has invested approximately $13 million toward the protection of the province’s inland fish stocks. It seems like only yesterday that the Inland Fish Enforcement Program was Danny Williams-Government's Provincial Government's way to send a message to Ottawa. The Inland Fish Enforcement Program was established by the Provincial Government in 2004 to address concerns raised by conservation groups and recreational anglers that the Federal Government was not living up to its responsibility to provide adequate enforcement and conservation of salmon and trout in coastal and inland waters. To cover this gap the Provincial Government provides over $2 million annually to ensure the preservation of trout and salmon stocks for future generations, including funding in Budget 2009: Building on Our Strong Foundation to purchase a new coastal boat.